How fun are these wall clocks? I especially love 1 & 5 because they're actually wall stickers - you just place your clock in the center of the sticker and voila! Which one is your favorite? P.S. - If you have a moment, hop on over to Ofifteen and check out my post on chic bathrooms! i love them all, but number 3 would have to be my fav. I have one of those silhouette clocks and everyday I see it, I think about how awesome it is! So fun and fabulous! I'm working on assembling a black and white gallery wall in my hallway, and number 7 would be just perfect! I like #1 & #7. How cute!!! love them all! if i had to choose, it would be between 3, 5 and 7. Cool! I actually have #7! I bought it at Target a few months ago on clearance for like $12! But #2 and 6 are pretty cool, too. how fun. no. 8 please. i think three is my next favorite for color, but 7 for shape. 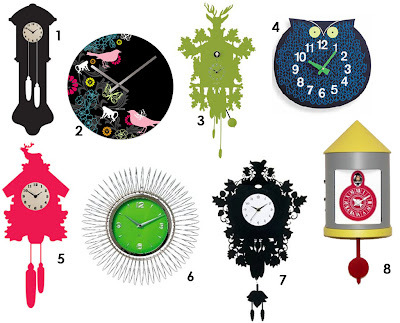 Wow, gorgeous clocks! I think my favorite is #2. I have a clock fettish...very cute! LOVE your clock pics - the third one is my fav! Nice pictures of home accessories. No. 6 please! If you like, check this topic on color inspiration on blog.maisondelyon.nl. Its in dutch but pictures are worth a thousend words. i resisted buying one though... only AUD$29.95!!! Oh what is it about pink that i fall for every time! No. 1 and 7(: I love both looks.